After two years of research and code testing, we are delighted to let you know about our progress with semantic indexing in OpenLabyrinth. Much of this progress is due to the work of Lazaros Ioannidis at Aristotle University, Thessaloniki in Greece. It is being featured in workshops and presentations at MEI 2015 in Thessaloniki today. So what the heck is semantic indexing? The foundation of Web 3.0, it allows discovery of content in new and interesting ways. 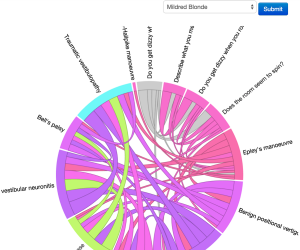 For our authors and learners using OpenLabyrinth, it opens up powerful new search capabilities and data visualizations. Imagine that you want a virtual patient case that addresses that common complaint seen in the emergency department: chest wall pain. How would you find this? With past methods, unless that phrase appeared in the title or descriptors for the case, you would be out of luck. Worse still, there are many synonyms and codes applied to this presentation: costochondritis, ICD9 = 786, Tietze’s syndrome etc. Semantic indexing opens up the possibility of searching by the concept of chest wall pain, looking up such synonyms and coding in related vocabularies and ontologies that already exist. More on this as we refine the tool. If you are interested in this research and its applications, contact us. This entry was posted in Uncategorized on 17/06/2015 by dtopps.